If you’d rather read it, the enhanced transcript is below. 1. Why did you write Start Small and Grow? I wrote the book, Start Small and Grow, to teach kids how to start a business. Because when I started a business, I knew I wanted to be professional, I knew I wanted to get business, but that was the extent of it. If I would have known what I know now, I would have been more successful early on and wouldn’t have had to deal with as many problems. I wrote the book to give them a roadmap for how you start, how you manage, and how you run a business. Whether it’s walking dogs or whatever, there’s a method for doing it. And if you have that method, it can really help. No matter who you are, you can become who you want to be. You can be the biggest business man. You can be the President of the United States. Start Small and Grow is a roadmap on how to start a business, but at the same time, it’s supposed to motivate kids to follow their dreams. Dream, plan, work really hard, and when something doesn’t work, you can’t stop. Keep moving. Persistence is key. If you keep going, keep dreaming, and keep being creative to change things that don’t work, you’ll get to be where you want to be. 2. Tell us about the Grand Slam Garage Sale Business Kit. We created a garage sale business kit to help entrepreneurs of all ages across the country start their own garage sale business. Whether they’re 14 or 70, they can start their own garage sale business. It’s full of information on how to start running a garage sale business. Once they buy a kit, they come up with their own company name and they’re completely free from us. We’re just giving them a kit on how to do it. They can choose how to price, what they want to name the business, etc. It’s $500 for the kit. If we were to franchise we would have had to charge a lot more. And there’s royalties involved, and so on and so forth. It’s a very simple model, but very solid model that can help tons of people across the world create this garage sale industry. We’re trying to help them anyway possible. We set this up so that anyone can do it. 3. With these two projects, essentially you’re training people, no matter the age, to follow your entrepreneurial path. Why would somebody want to be you? Well, why wouldn’t they want to be me? Just kidding [laughs]. I don’t know if they’d want to be me exactly. This lifestyle is a lifestyle of dreaming, chasing, and conquering your dreams. I can’t say that I’ve conquered my dreams, yet. But I can say that I’ve started to see the progress towards making it to that point. I think everyone should want to go after that lifestyle. You live once. You gotta dream big and you gotta go after it. Start Small and Grow: A Business Lesson for Kids – You can still get it in time for Christmas! 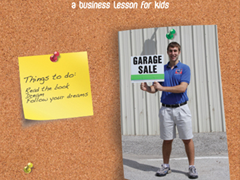 Grand Slam Garage Sale Business Kit – Check out the business model he created there. Ben is one of those people who will always be a CEO. He has me convinced that entrepreneurship is the best thing that has ever happened to him. So much so that he created two products to help you do the same. You’ll be seeing more of him in the next few years ;).